Join us for a revolutionary evening of revelry in support of ShaLeigh Dance Works’ 2017-18 Season. Experience performances, music, speakers, art, poetry, dancing, a silent auction and loads of kindred camaraderie. We were excited to present “I Promise (excepts)” at Loose Leaves Showcase in Charlotte, NC. This showcase “presents Charlotte’s most diverse dance showcase featuring new and unexpected dance works by local Charlotte choreographers.” For more pictures and information please see Loose Leaves Fall 2017 Facebook event page. Above you will see my treasures; an incredible cast of strong individuals, each an artist in their own right. We began making this work over a year ago and quite similarly to the social climate of our country, it has been a struggle. And its for certain about struggle. And its about all of the things we can not say about this kind of struggle, which is where the walls we push against began. It is where our dance began as well. It is why in the end, we did not need literal walls to feel it. The evening’s final work was a marvelous surprise, and although it utilized spoken texts and songs, it is resistant to wordy explanation. By Shaleigh Comerford and the dancers of her company, with textual assistance from playwright Richard Kirkwood and music written and performed on stage by cellist Isabel Castellvi and pianist Randall Love, Dedicated to [ ] Because of [ ] (and Vice Versa), improbably combines six female dancers in short pale satin gowns with metal folding chairs and – actor Derrick Ivey. Comerford’s dance language, with its mix of Gaga-style freedom of movement and balletic elegance, is well suited to the complex balance of dance theatre. The ensemble’s rather gorgeous fluidity and sharp repetitions – and their strange actions, both seductive and evasive – encounter Ivey’s massive physicality like ocean waves meeting offshore rock. Comerford is a versatile dance artist who teaches at Elon University, as well as at two of Durham’s non-ADF studios (two of her current dancers also teach at Ninth Street Dance). ShaLeigh Dance Works’ world premiere of “Alo” conjured an experience Saturday at Reality Ministries. This was the last in a two-day run presented under the auspices of Durham Independent Dance Artists. The space itself cast a spell even before this dance theater work began. Who would have thought, from the old building’s brick exterior, that it contained such a beautiful, evocative space with a high, domed ceiling? 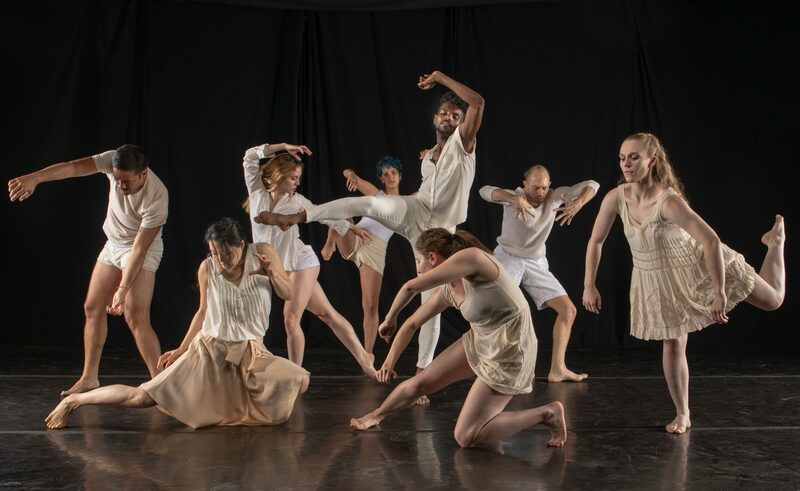 It’s no whim that choreographer ShaLeigh Comerford chose to have the audience sit in a circle for the premiere of her evening-length work, “Aló.” That premiere, presented by Durham Independent Dance Artists (DIDA), takes place Friday, May 1, and Saturday, May 2, at Reality Ministries in Durham. The seating configuration fits into the nature of that work as well as Comerford’s overall mission. “The circle is a metaphor for unity and connection,” the choreographer said in a telephone interview. “‘Aló’ speaks to multiculturalism, to ways we connect to each other through the experience of our hearts,” she added.